This is a sponsored conversation on behalf of Workman Publishing; all opinions and text are my own. Thank you for supporting the brands that support this site! If this is you, too, I have some advice for you. First, don’t worry about all of the specialized functions and buttons at first. Try a simple and easy to follow recipe, like these Instant Pot hard boiled eggs. In this “recipe”, I walk you step-by-step through using your Instant Pot to make hard cooked eggs that have perfect creamy and yellow centers. It’s great for getting acquainted with your new Instant Pot, and you’ll be amazed at how easily pressure cooked eggs peel! 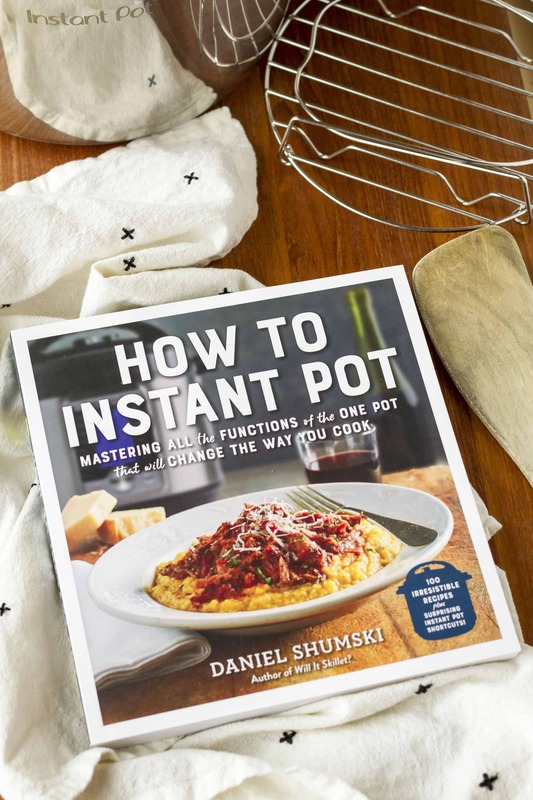 Second, pick up a copy of How To Instant Pot by Daniel Shumski! I’ve had the pleasure of previewing several new release cookbooks focused on cooking with your Instant Pot, and this is by far the best I’ve seen. It’s filled with approachable and practical recipes with clear instructions that will help you master your Instant Pot in no time. I love how each recipe is presented as a base recipe (called the Master Method) and is then followed by variations on that base, along with tips and suggestions for how to customize it further. How To Instant Pot isn’t just your average cookbook filled with recipes — it actually teaches you how to cook by customizing and create your own recipes! How To Instant Pot is smartly organized by function, with recipes for not only using your Instant Pot as a pressure cooker, but demonstrating how you can also use it as a slow cooker, rice maker, yogurt maker, and a steamer. I actually have yet to use mine as a rice or yogurt maker, so I’m really looking forward to trying those methods myself. Our weather has definitely taken a turn for the colder, which always has me craving comfort food. So I pulled out my How To Instant Pot cookbook yesterday and made the Meat and Potatoes Beef Stew — and it was fabulous! 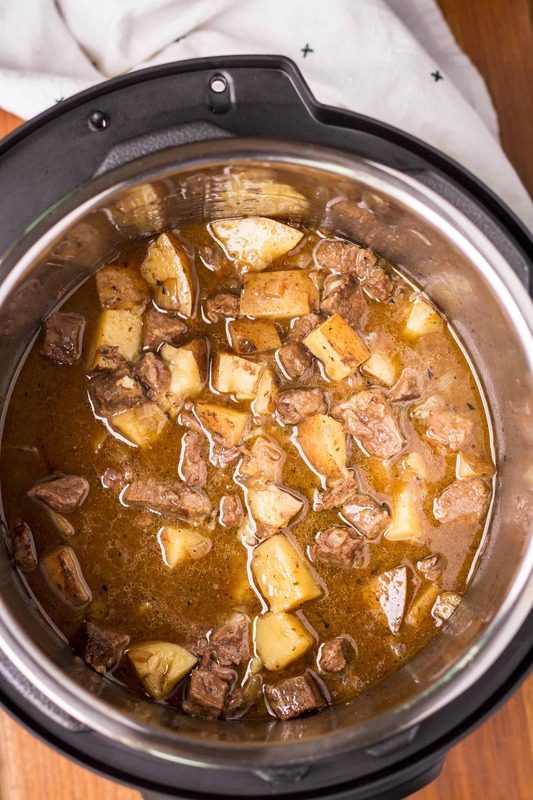 When it comes to tough cuts of beef, you simply won’t believe the magic that happens in the Instant Pot. 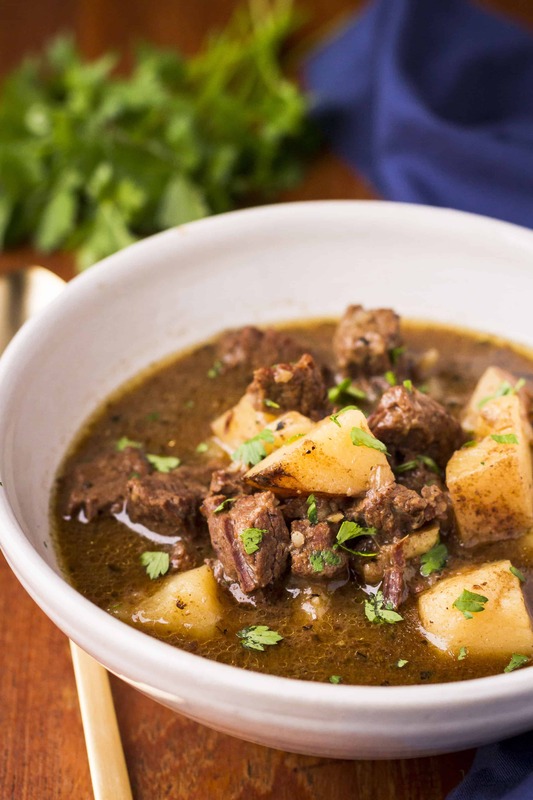 Stew beef turns out fork-tender in far less time than traditional beef stew recipes. I do feel like a good deal of the prep work could have been cut out of this recipe. There’s a lot of separately sautéing and removing the onions and beef, where I would typically just sauté everything together at once. I’ve provided the recipe as written in the cookbook, but just know that you may be able to condense some of the initial steps to save time. 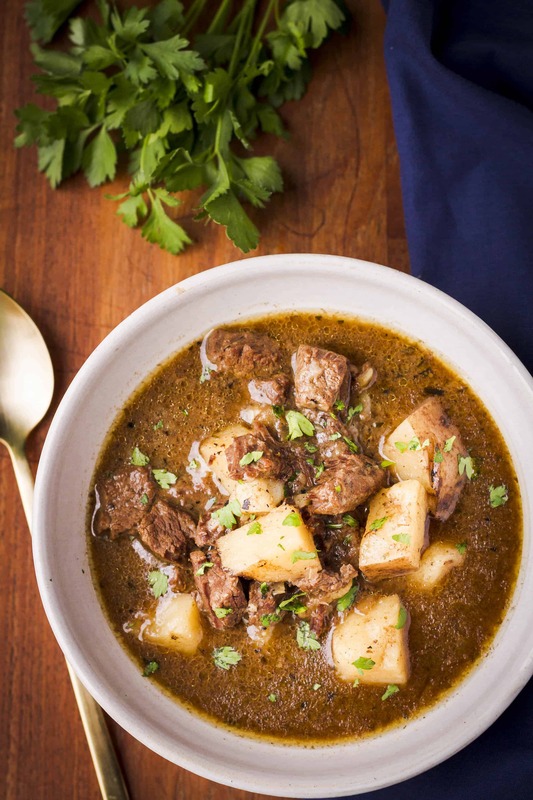 A hot, steaming bowl of this comforting beef stew is just what you need on an icy cold day! Serve it with a simple salad and a crusty baguette for a truly satisfying meal. TIP: This recipe makes about 6 servings as written. Stretch it further by serving it over rice or cooked egg noodles! Press sauté and select the middle temperature. Place 1 tablespoon of the oil in the inner pot, wit about 2 minutes for the oil to heat, then add the onion, rosemary, thyme, oregano, cayenne pepper, and balsamic vinegar. Cook with the lid off, stirring occasionally, until the onion softens slightly. Remove the onion to a bowl; set it aside. Place the remaining oil in the inner post, wait about one minute for it to warm, and then add half of the beef. Cook with the lid off, turning the beef occasionally, until it is browned on most sides, about 5 minutes. Transfer the browned beef to a plate and set aside. Repeat with the remaining beef. Close and lock the lid. Set the valve to sealing. Press cancel then select high pressure and set the time to 20 minutes. Remove the lid and taste the stew for seasoning, adding salt and pepper as needed. Serve hot, garnished with parsley. Vegan chili is my instant pot go to meal. My favorite instant pot recipe is mac & cheese! I’ve never tried these but the chili sounds amazing! I don’t have an instapot but I would love to try a chicken and dumplings meal. My favorite is Crispy Chicken Carnitas. I don’t have one yet but would make chicken and beef with veggies. I do not have an instant pot but I would love to try chili. I don’t have an instant pot yet but I’ve been seeing so many wonderful recipes. I would love to try to make sweet potatoes in one. So happy I opened my email tonight..I’ve been so busy..and almost missed the big event! Your recipe looks delicious..the rich broth in photo is wanting some crusty bread to sop up. I have meat and potato eaters..who would,love it. Instapot is on my wish list..first up to make for me will be my grandmas chicken and dumplings or my dads pot of beans. I’m getting one for Christmas so I don’t have a fav yet. But, I want to try chili in it! I’ve done corned beef and cabbage in it! So good! Pork steak is my favorite instant pot recipe, YUM. I make a delish rice beef stew in mine! Mine would be beef and broccoli. I love the way it prepares brown rice – not really a recipe, but super helpful to make large, fluffy batches and then freeze it! My favorite Instant Pot recipe is pot roast! My favorite is instant pot beef curry. I’ve got an instant pot, but I’m a bit intimidated by it. I made a corned beef recipe from Dad Cooks Dinner that was pretty good, but I ended up overcooking the meat, so it got a bit mushy. Yes, that can definitely be one of the tricky points! I made a ham in mine for Thanksgiving, and it was delicious but almost too tender. When I’m making a new recipe, often I will undercook it a little to check the meat. You can always re-pressurize it and cook it for longer if it’s not done. 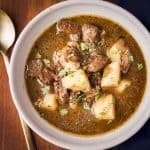 Well I do not have an Instant Pot this recipe looks very good and would be my first. I am very interested in purchasing one since I saw a report on a women who lost 100 lbs using solely the instant pot…That peaked my interest a great deal.. I love my instant pot for cooking tender cuts of meat!